Donald Trump is a billionaire. Just how many billions of dollars he is worth is a subject of dispute. Trump claims that he is worth more than $10 billion while Forbes estimates he is worth less than half that amount. But Trump IS a billionaire ... and his presidential opponent Hillary Clinton is not. What Clinton has is a growing list of billionaires who support her -- despite the fact that she's a Democrat who has called for tougher laws regulating Wall Street and higher taxes on the wealthy. Warren Buffett, the fourth-richest person in the world, is her most prominent backer. 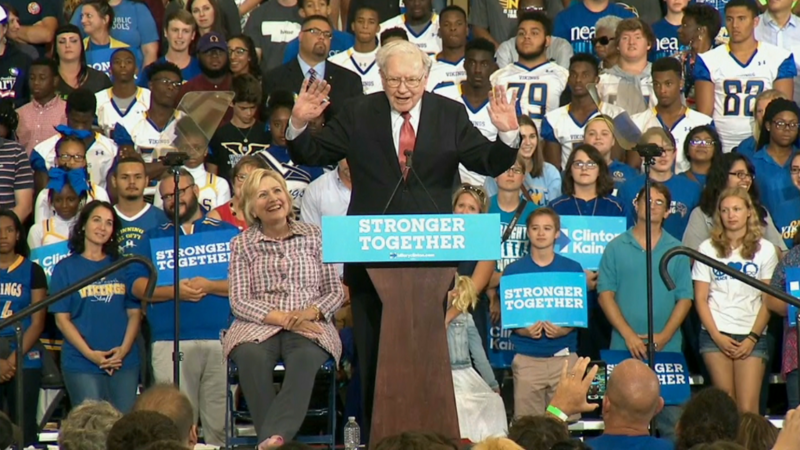 Buffett, the CEO of conglomerate Berkshire Hathaway (BRKB), endorsed her late last year. When asked in late April at Berkshire's annual meeting about how a possible Trump presidency would impact the company's financial performance, Buffett quipped "that won't be the main problem." And on Monday, Buffett challenged Trump to show his tax returns -- something that Trump has so far been unwilling to do. Buffett also took issue with Trump's claims of being a successful businessman, saying that a monkey throwing a dart at stock tables would have done better than someone who invested in Trump's once-publicly traded casino company. The Oracle of Omaha isn't the only billionaire to say "I'm with her." So have prominent hedge fund manager George Soros, Facebook (FB) COO Sheryl Sandberg, former NYC mayor Mike Bloomberg, Salesforce (CRM) CEO Marc Benioff and Dallas Mavericks owner/serial entrepreneur/reality TV show star Mark Cuban. Amazon (AMZN) CEO Jeff Bezos, who personally owns The Washington Post (and just passed Buffett to become the world's third-wealthiest person) has also criticized Trump for his frequent boycotts and vendettas against various news organizations. Several of these super rich have cited concerns about Trump's stance on immigration and tough talk regarding trade with China, Mexico and other foreign nations as reasons they don't support him. Trump is so much more of a political wild card than Clinton. His often outlandish comments on the campaign trail (and Twitter) are clearly making some of the nation's wealthiest nervous -- even though Trump is one of them, at least when it comes to being a billionaire. There is also a perception that Trump could be more problematic for billionaire bankers than Clinton, who has been criticized by Trump and her former Democratic rival Bernie Sanders for her ties to big Wall Street firms. Trump has even called for a return to the Great Depression era Glass-Steagall laws governing banks. That would effectively prohibit many big banks like JPMorgan Chase (JPM), Citigroup (C) and Bank of America (BAC) from owning Wall Street firms. The Democrats did wind up adding Glass-Steagall in their party platform too -- a nod to the influence that Sanders has had during the campaign. Still, it would be a mistake to say that billionaires are exclusively lining up behind Clinton. Trump has his fair share of well-known billionaire backers as well, including casino magnate Sheldon Adelson, investor Carl Icahn, oil king T. Boone Pickens and venture capitalist (and Gawker hater) Peter Thiel. But two other prominent Republican billionaires -- brothers David and Charles Koch -- have yet to publicly support Trump. They aren't necessarily backing Clinton. Still, their lack of an endorsement for Trump has raised eyebrows on Wall Street and in Washington. The Kochs have often been referred to as king makers in political circles. But if their failure to get behind Trump winds up costing him the election, then they might wind up being known as queen makers instead.